As 2015 comes to a close, brand managers and marketing departments around the world are looking for ways to efficiently spend their remaining marketing budgets. As 2016 comes around those same departments will be looking to spend their fresh budgets effectively. Increasing exposure, sales, and ultimately increased profit is the end goal with this. Need to use up your 2015 marketing budget? Read on to learn great ways to utilize these funds to drive sales. As body shop have done here, their great promotional bag can be used to store the products bought in store. This not only increases chance of impulse purchase, but is also upselling the entire product portfolio of body shop. All their products can fit neatly in the promotional bags. A Gift with purchase are a great way to do this, and is an affordable way to use up your 2015 marketing budget. 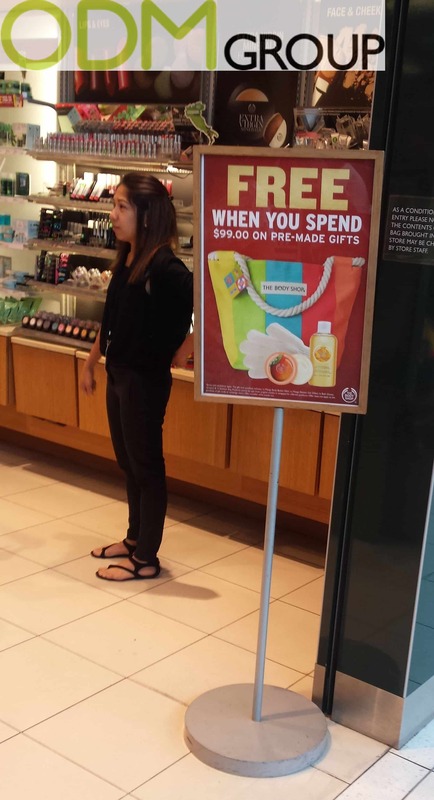 Combining the promotional benefits of a Point of sale display and a gift with purchase. 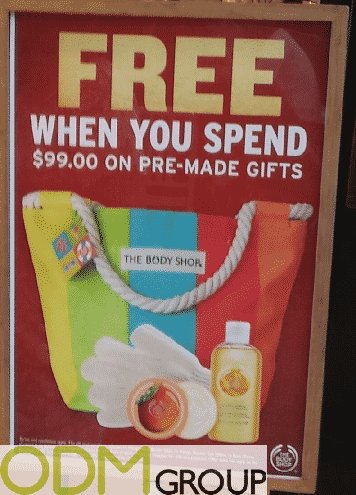 As body shop have done here, they are displaying their gift with purchase with a basic POS display, advertising the promotional product upon entry to the store. Your Marketing budget can be used in this way too, both a gift with purchase and an in store display. A great way to promote the store, the product and the brand. Affordable marketing – Using your marketing budget on affordable means of product promotion is essential. A promotional product such as a bag as gift with purchase is a great way to utilize brand activation. Promotional Bags are great as they are re-usable by your consumer, and with a great design they are eye-catching and more likely to be re-used. Brand broadcasting is essential in a marketing campaign, this is a great way to achieve it. With over 10 years of experience in product manufacture, sourcing and product design, at ODM we can help you utilize your marketing budget. Contact us to find out how we can help. If your interested in gift with purchase, or a POS display we have portals dedicated to this on our website, ever expanding.